We will be there to listen to you on the phone, by email or text or you can visit us in person. You can talk to us, in your own way, and off the record - about whatever's getting to you. You don't have to be suicidal. We have volunteers who train and support the Listeners at Parc Prison each week so they can help and support their fellow prisoners. We run emotional health sessions, awareness raising events and support Freshers Fairs in local schools, colleges and training centres. We go out in the community. At the moment we have volunteers supporting people in Bridgend town centre every other Saturday night; at the Princess of Wales Hospital every other Wednesday morning; at the Custody Suite in Bridgend; and attending events and shows throughout the region. Set up in 1972, Bridgend Samaritans have been supporting our local community for over 45 years. There are 88 volunteers who provide a telephone, email, SMS and face to face listening service every day of the week, including weekends and overnights. In 2018 we spent over 4,500 hours on the phone answering over 24,000 calls, replied to 1,000 email messages and 3,000 texts. Could you help by answering calls to people experiencing feelings of distress or despair, including those which may lead to suicide? Maybe you would also like to go out with our van to offer emotional support to our local community? If you don’t want to answer the phone or meet people face to face - maybe you can reply to emails and texts from our callers who need emotional support? Perhaps you could provide admin support? Could you give talk to schools and groups about their emotional wellbeing? Fundraise for us and publicise who we are and what we do? Be on our committee and help to run our branch? Train others to be listeners or support volunteers? Gallwch wneud gwahaniaeth syfrdanol gyda’r Samariaid trwy helpu i gynorthwyo pobl sy’n defnyddio ein llinell Gymraeg. The branch was founded in 1972 out of the concern from some local ministers in Maesteg, over the deprivation and the resultant family problems in the valleys, so on 30th June, we had the official opening of the Maesteg branch by the director of Swansea Samaritans, officials of Maesteg Council and the regional representative. By 1975 it was clear that Maesteg branch wouldn't be able to open 24 hours a day, which was one of the aims in the future for the branch. 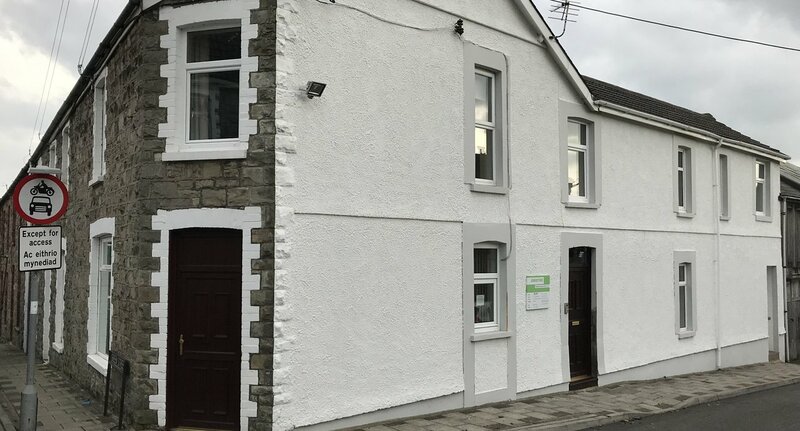 It was felt that the branch would have to move to a more central location in Bridgend to be able to justify a 24 hour branch and so in 1975 Maesteg Samaritans moved to Wyndam Street. In 1978 we moved to a house on Coity Road, where we stayed for 10 years and finally in 1988 we moved to our current premises in Green Street, where we have continued our 24 hour service ever since. Bridgend Samaritans, a registered charity (1170848). Bridgend Samaritans is a recognised branch of Samaritans.